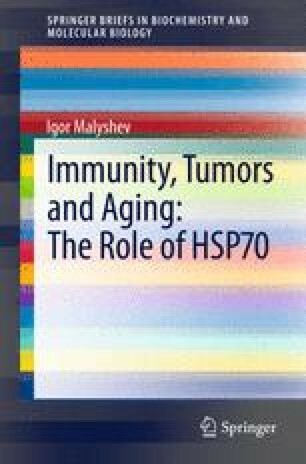 The main participants that regulate HSP70 synthesis are the HSP70 genes and the HSF-1 transcription factor. In a non-stressed cell, HSF-1 exists within the cytoplasm in an inactive monomer state. The inactive state of the HSF-1 monomer is supported by the «HSP90-p23-immunophilin» complex and, possibly, by intramolecular hydrophobic bonds and phosphorylation of specific HSF-1 serine residues. HSP70 and HSP40 participate in the formation of the inhibitory complex. Activation of the HSF-1 transcription factor occurs in two steps. The first step occurs when emerging denatured and/or misfolded proteins induce removal of the negative influence of the «HSP90-p23-immunophylin» complex, trimerization of the HSF-1, and the binding of trimerized HSF-1 to a specific region of the hsp70 promoter, termed the HSE. In the second step, the negative influence of the «HSP90-p23-Fkbp52» complex is abolished and transcription is activated. Inactivation of HSF-1 and cessation of HSP70 synthesis occurs when HSP70 and HSP40 bind to HSF-1, and thus inhibit HSF-1 transcriptional activity. Thus, the system of HSP70 synthesis includes an autoregulation mechanism; the ability of HSP70 to inactivate its own transcription factor.